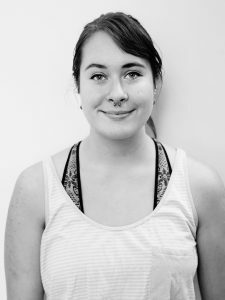 Jessica Thomas is the scenic charge artist and technical assistant for Skidmore Theater, as well as stage manager for Skidmore Dance. Originally from the northernmost reaches of Idaho state, she has worked extensively around the Inland and Pacific Northwest regions. Having earned her BFA in Technical Theatre from the University of Idaho, she has gone on to work professionally for companies such as Opera Coeur d’Alene, Spokane Civic Theatre and UI Dance (in collaboration with the Lionel Hampton School of Music), as well as at venues such as Schuler Performing Arts Center and the INB Performing Arts Center. Jessica regularly volunteers as a mentor in scenic art at Upper Dublin High School in Fort Washington, PA, and in the summer she can usually be found in the paint shop of Texas Shakespeare Festival in Kilgore, TX. Jessica regularly works in both scenic art and stage management, but considers herself to be a theatrical jack-of-all-trades, and believes strongly in well-rounded communication and collaboration. She is thrilled to be working with such a talented family of theater artists, and hopes to continue to learn as much as she contributes.